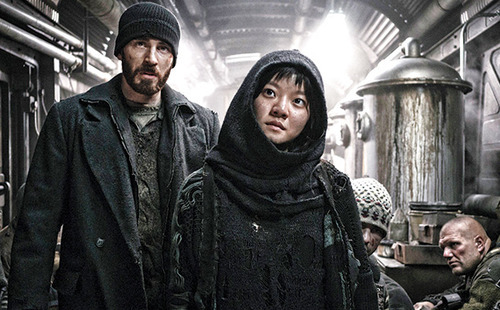 Movie Review: “Snowpiercer” is Sci-Fi done right. An amazing movie. 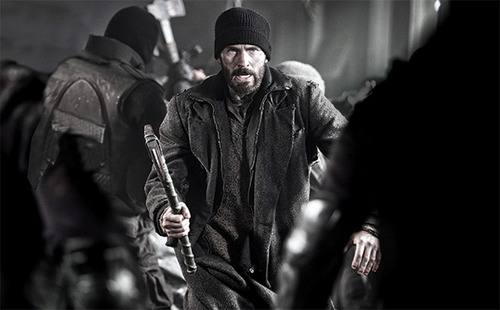 Home /Editorials, Movies, Reviews/Movie Review: “Snowpiercer” is Sci-Fi done right. An amazing movie. Let me paint a picture for you guys. This was the kind of day I had when I went to go see Snowpiercer. I live near Anaheim, and I had a full day planned that included seeing this film. I originally planned on being in LA at 10am to meet a friend. I then was going to check out the film at a 2pm showing, catch up with another friend after the film then head back to the OC to celebrate fellow Agent of GUARD pal Bobby Johnson’s birthday. What ended up happening was me getting stuck in traffic for FIVE HOURS due to a terrible and horrible accident on the freeway. The delay basically ruined my whole day. It was a stressful, long, and maddening affair to deal with. In that amount of time I could have driven to San Diego and driven back. I could have been about an hour way from San Francisco. I could have just turned around and went home, but by that point I was already stuck on the freeway for three hours and I just decided to fight on through. I also decided that I was going to end up seeing Snowpiercer no matter what that day. I wanted to support this film’s release as I was such a big fan of director Bong Joon-Ho’s previous work. I wanted to support new movies based on ideas we haven’t seen on the big screen yet. I was NOT gonna let this traffic jam stop me. So I thought, “I better really like this film,” especially after going through all that. Snowpiercer is set in a world after a failed global warming experiment caused the whole planet to be covered in ice and snow. 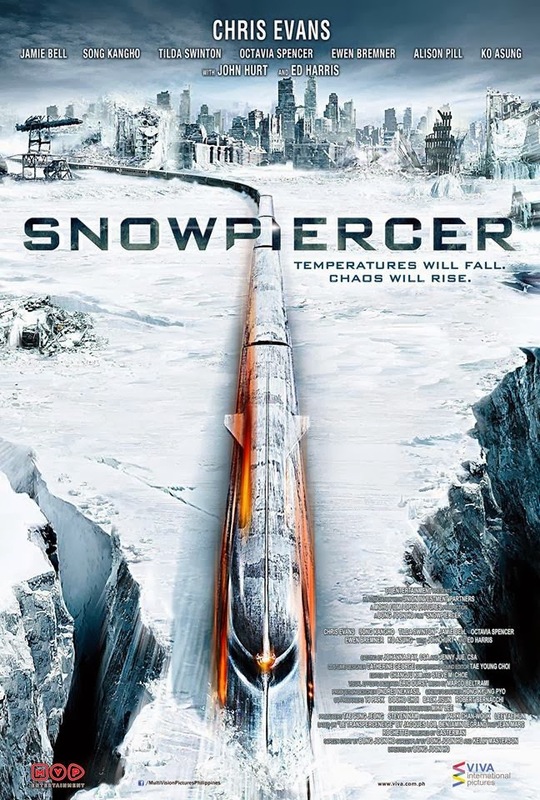 The lucky few who survived this event became the passengers of the super train, Snowpiercer. In the 17 years since the train’s launch, the people who live on it have created a split society. The people in the front are the privileged who live in luxury, and the people who live in the tail end live in squalor. We follow Chris Evan’s character Curtis, a man who lives the in the tail end of the train. He is planning a revolution. He wants to make it to the front of the train and take out the leader Wilford, the mysterious creator of the train. 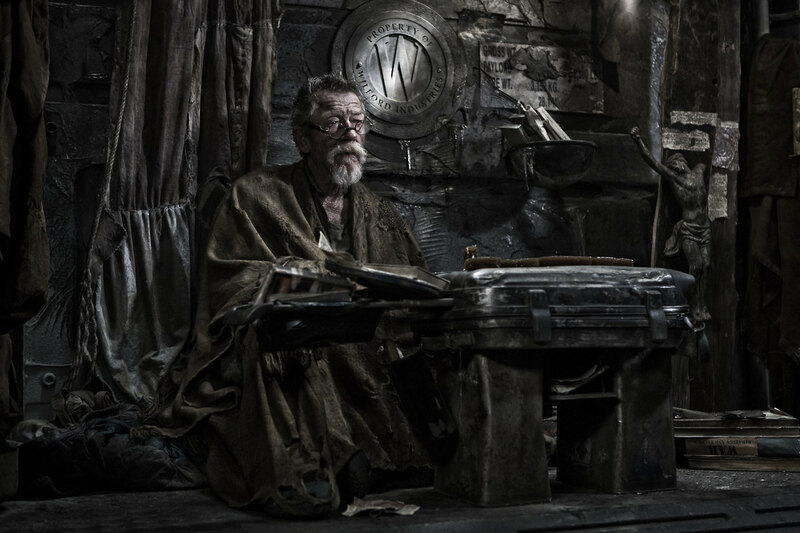 Curtis plans to do so with help from his mentor (and the leader of the people of the tail end) Gilliam, played by John Hurt, his second in command Edgar (Jaime Bell), and Tanya (played by Octavia Spencer) a mother who will fight to protect her son. They need to get past Mason (the amazing Tilda Swinton), who is the public face and voice of Wilfrod, her army, and the many passengers of various degrees of insanity in order to get to the front. This is the kind of sci-fi films they don’t make anymore. This film can be looked at as either an intense thrill ride of Sci-Fi action or a film that questions society and times we live in – in a smart and entertaining manner. The original Planet of the Apes does this brilliantly. It’s still a fun, thrilling and dark adventure tale, but it still asks questions about the future in society and worries about what our own nature as human beings will allow to happen. 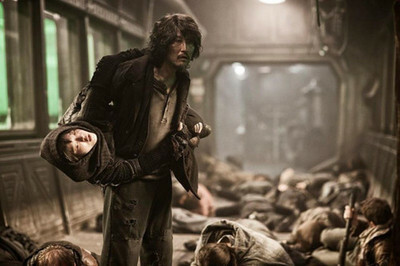 Snowpiercer isn’t just a film with a cool premise, it’s also a film that understands that we need strong and unique characters to help us connect to this world. This film’s script moves in a rapid pace, but still understands when to have the character take a moment and breath. The film also isn’t afraid to embrace the weirdness of the world, and allows legitimate moments of levity to break up the bleakness of this future. The structure is quiet simple really. Each new car the characters enter, gets us further away from horrible, dirt filled world of the train we saw in the beginning, to the fantastically fake luxury of the front of the train. As we get closer to the front, the world of the train gets weirder. I personally kept seeing a twinge of Terry Gilliam influence in the film, and I’m sure that naming Hurt’s character Gilliam is a nice nod to the director himself. Snowpiercer delivers on the action, and each sequences is unique to the train car the characters are on. It’s excellently staged by Bong Joon-Ho, as he creates a vast variety of action scenes, making it all somehow work, even when it’s a confined space. There is an amazing sequence in the middle of the film that uses the power of light in an exciting manner that needs to be seen on the biggest screen possible. But the film can not live on great sequences and good ideas alone. What made me fall in love with the film are the characters. John Hurt, Jamie Bell, and Octavia Spencer all do great work in this film, and I loved their characters, but let me focus on some of my favorites. You think you know what kind of character Chris Evan’s character is judging from my subscription, but let me tell ya, you don’t know anything. Curtis is far more complicated then he appears, and the more we learn about him as the film develops, the more you are fascinated with his actions. Evans delivers one of his finest performances on film yet, showing that spark of charisma that we knew he has on screen, but also giving us some of the most gut wrenching moments in the film. Tilda Swinton is in another world in this film. Mason is a bizarre character, but Swinton delivers on bringing in one of the most memorable performances of the year. I honestly don’t believe Tilda was acting here. I think the character Mason somehow manifested itself and possessed her. She definitely used the possession to her advantage. One of my favorite Korean actors (and Director Bong Joon-Ho’s usual leading man) is Kang-ho Song, and he plays Namgoong Minsoo. Namgoong is the man who designed the security doors in the train, but was locked up once he became addicted to a drug called Kronole. Curtis and the gang break him out, promising him a regular supply of Kronole in return for opening the security gates of the train. It’s a simple deal, until Minsoo adds one stipulation: That they bring his daughter, Yona, with them too. I absolutely love these characters. Kang-ho Song delivers all the cool attitude in this movie, and brings his own unique on screen charisma. It balances out well next to Chris Evans more straight forward character. The film even uses a fun film device in which we see Minsoo and Curtis using a universal translator, which allows Kang-ho to still speak in his native tongue, thus giving us a performance that feels relaxed and natural, with out the awkwardness of playing the role in English. Actress Ah-Sung Ko and her expressive eyes does a ton of work in her role as the slightly off (and possibly clairvoyant) Yona. Her work with Kang-ho is great, and you get a real sense of their history together in just their performance. It must help that this is not the first time they played father/daughter, since they also had that relationship in the directors previous film, The Host. Like I said, I love watching these two. I would watch a series of movies of the adventures of Minsoo and Yona. The film is a technical marvel. We’re treated to a great, atmospheric score from Marco Beltrami, a composer who I’ve always thought was decent but never really one of my favorites. With this film, however, Beltrami does some of his best work ever, creating the appropriate mood in every mini-world our characters enter. Cinematographer Kyung-pyo Hong shoots every mini-world in the train with great detail. Whether he creates a grimy and dark world of the tail end of the train, or the bright and colorful world of the people of the front the train, Hong delivers eye candy through out the whole film. Great sci-fi films are harder to get nowadays. 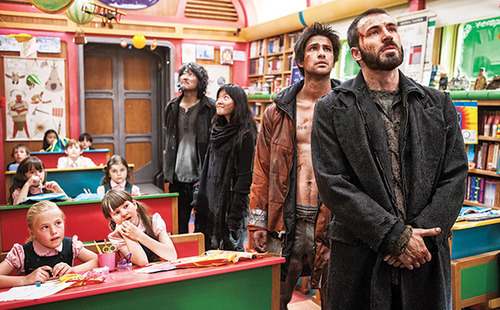 Snowpiercer is finally an new addition that we can be happy to enjoy. It deals with some heavy concepts, especially in how it handles metaphor and characters. This is rich with world building, which is great since it’s a new world that we haven’t seen in films yet. I know the film is hard to find right now, since it has only been released in 8 theaters through out the whole country. If you can find your way to a theater that is playing it, then I can’t stress enough that you should see it right away. This needs to be seen on a big screen, especially since I don’t know when you will get a film like this on the big screen again. LOOKING AHEAD: New movies for July 2, 2014.